Black Floridians are African Americans sampled in the state of Florida. Usually carrying about one-quarter white admixture, they also can have significant amounts of American Indian ancestry, particularly Creek, Cherokee, Choctaw, Appalachee, Gullah, Yuchi, Timucua, Calusa, Yamacraw and Seminole. Zora Neale Hurston (January 7, 1891 – January 28, 1960) was an American author during the time of the Harlem Renaissance. She came from Eatonville, Florida, the first all-Black town to be incorporated in the United States. Black backwoods Florida is the home of the expression juke joint. The Black – Florida population data represent autosomal DNA samples from 50 African-American individuals in the state of Florida. For details on this population, see:African American, Florida. Samples were provided by the Florida Department of Law Enforcement, the Metro-Dade Police Department, the Miami Children’s Research Institute, and the Palm Beach County (Fla.) Sheriff’s Office. 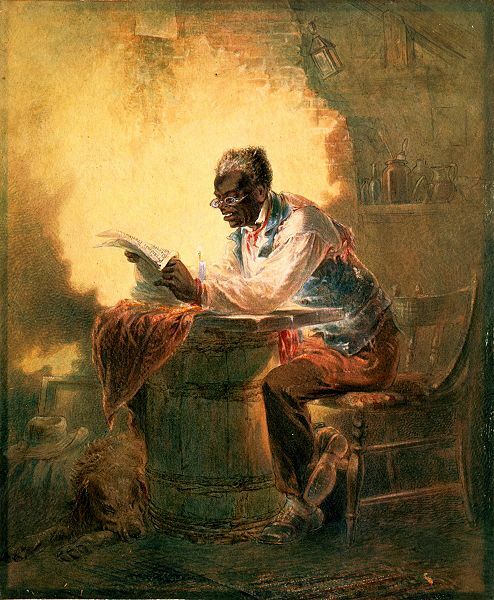 Photo: Black man reading newspaper by candlelight. Man reading a newspaper with headline, “Presidential Proclamation, Slavery,” which refers to the Jan. 1863 Emancipation Proclamation. Drawing : watercolor. Date c. 1863. Source: Library of Congress, Prints & Photographs Division, LC-USZC4-2442. Author: Henry Louis Stephens (1824–1882). Source publications: Allele Frequencies for Fourteen STR Loci of the PowerPlex 1.1 and 2.1 Multiplex Systems and Penta D Locus In Caucasians, African-Americans, Hispanics, and Other Populations of the United States of America and Brazil, Levedakou et.al, JFS, 2001, 46(3) 736-761. CODIS STR Loci Data from 41 Sample Populations, J Forensic Sci, 2001, 46(3), 453-489.